Above: Terry Teo Artist and Co-Creator, Bob Kerr. Photo by Nick Reed. In today's NZ Herald, Terry Teo Artist and Co-Creator Bob Kerr answers 12 questions on the creation of the original Terry Teo graphic novel, his paintings, and more. 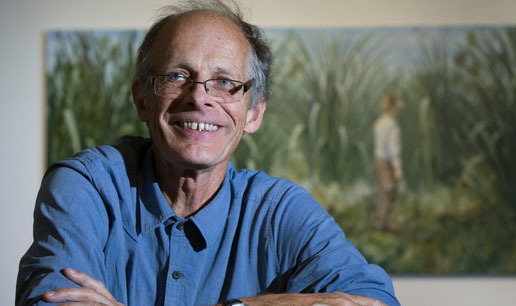 Discussing his early career as an author/illustrator, he told the NZ Herald, "We live in a culturally rich country. I was part of a new wave of people who wanted to produce New Zealand books. Most of us came through Writers in Schools. Joy Cowley organised a very lively meeting at her place in the Sounds in the late 80s. We all got together - Lynley Dodd, Gavin Bishop, Tessa Duder - and had a rip-roaring weekend. It was an exciting time. Kids now are growing up with a Disney-fied universal culture driven by mass market economics. I want our kids to know about where they live." As for being approached to turn Terry Teo into a TV series in the mid-1980s, Bob recalls, "there was a knock on the door and a film producer wearing a safari suit said, "Hello, I'm Logan Brewer. I'd like to make a TV series." Steve and I thought this must be what happens. We were just naive goofs along for the ride. Steve wrote nine episodes of TV script but only six were made because skateboarding went out of fashion, according to the funders".